My sister and I are now in Tokyo! We met up with our cousins and their friend (also traveling in Japan at the same time as us) for lunch. We had pancakes and pies for lunch. Yep, breakfast and dessert for lunch!! Sour cream apple pie also called “apple pie with sour cream custard” in other places. The bottom is typically a crust, layered with tart apple slices and topped with streusel (crumbs). Matsunosuke uses Kogyoku apples, which is a Japanese apple similar to Granny Smith. They also served their sour cream apple pie cold, with a sprinkle of powdered sugar on top. Traditional Dutch apple pie comes in two varieties, a crumb (appelkruimeltaart) and a lattice (appeltaart) style pie, both recipes are distinct in that they typically call for flavourings such as cinnamon and lemon juice to be added and differ in texture, not taste. Dutch apple pies may include ingredients such as raisins and icing, in addition to ingredients such as apples and sugar, which they have in common with other recipes. Recipes for Dutch apple pie go back centuries. There exists a painting from the Dutch Golden Age, dated 1626, featuring such a pie. A recipe in a late medieval Dutch cook book ‘Een notabel boecxken van cokeryen’ (from around 1514) is almost identical to modern recipes. The basis of Dutch apple pie is a crust on the bottom and around the edges. This is then filled with pieces or slices of apple, usually a crisp and mildly tart variety such as Goudreinet or Elstar. Cinnamon and sugar are generally mixed in with the apple filling. Atop the filling, strands of dough cover the pie in a lattice holding the filling in place but keeping it visible or cover the pie with crumbs. It can be eaten warm or cold, sometimes with a dash of whipped cream or vanilla ice cream. 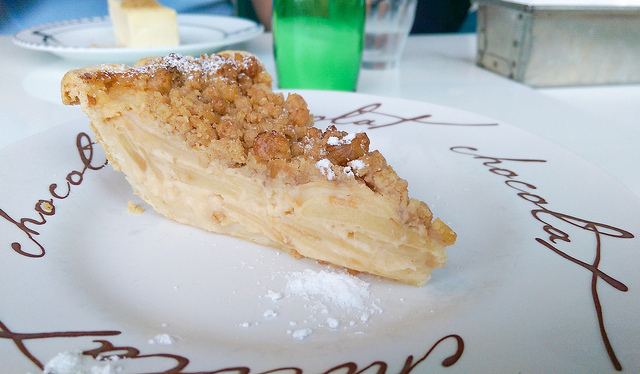 In the US, “Dutch apple pie” refers specifically to the apple pie style with a crumb, streusel, topping. Tags: appelkruimeltaart, apple pie, サワークリームアップルパイ, dessert, dutch, dutch apple pie, foodtouring japan, foodtouring tokyo, MATSUNOSUKE N.Y., netherlands, pie, sour cream, sour cream apple pie, sweets, 松之助 N.Y.